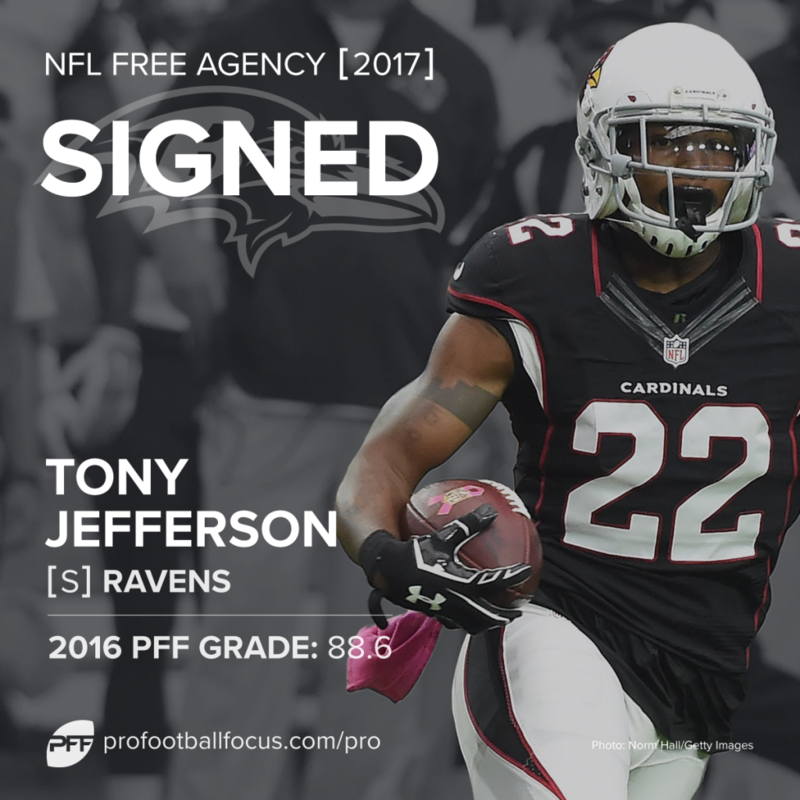 Free agency is by now well underway, and PFF will be bringing back the deal grader, where we put a grade on every signing that’s made during the madness. We will grade a deal as soon as contract numbers are available. Some teams keep these under wraps longer than others, so some deal grades may be slow in coming. We will be basing the grades largely on PFF’s play-by-play grading system, but also take into account various subjective criteria such as age, off-field issues, and what else was available at the time. For the first time, PFF has also developed a metric that calculates the contract a player should have received based on his previous three seasons worth of play (noted as “play-earned contract”). In some cases, the metric will highlight players that have dramatically over or underperformed relative to the contract they have just received, providing an interesting contrast to the wild west that is the NFL free-agent marketplace. And new this offseason, we are also offering grades to every trade made during the free-agency period as well. Scroll to the bottom for the grades for each trade. 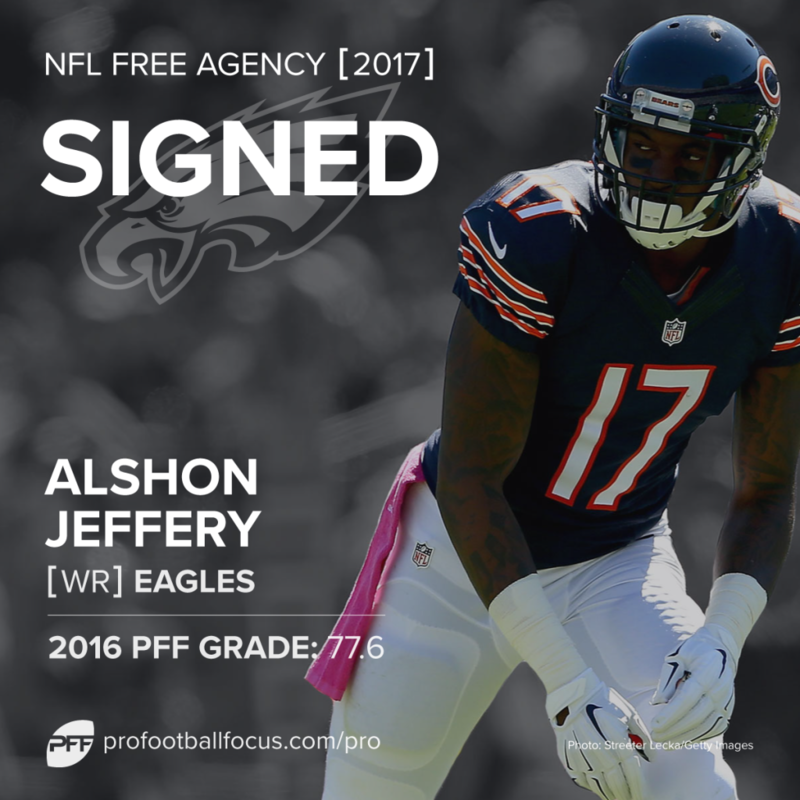 There are a lot of question marks surrounding Alshon Jeffery, and so a short-term, prove-it deal makes a lot of sense for all concerned. The Eagles managed to get that deal done at a significantly lower than the price of the franchise tag figure that the Bears were balking at. This could be a good move for all parties. A year ago, A.J. 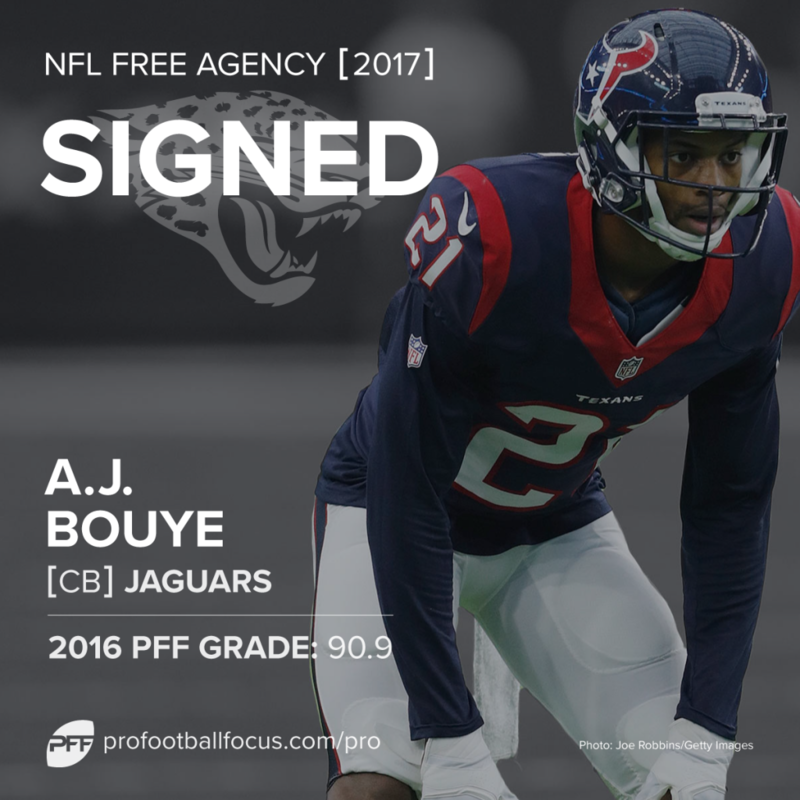 Bouye was an unknown quantity, but he finished the season as PFF’s third-ranked CB with an overall grade of 90.9. Bouye allowed just 54.5 percent of passes thrown his way to be caught for only 9.8 yards per catch, and showed legitimate No. 1 corner upside. Age prevents the PFF metric from giving Whitworth anything more than a two-year deal, but at 35 years old, he is still playing at an elite level for left tackles, allowing just 14 total QB pressures in 2016. 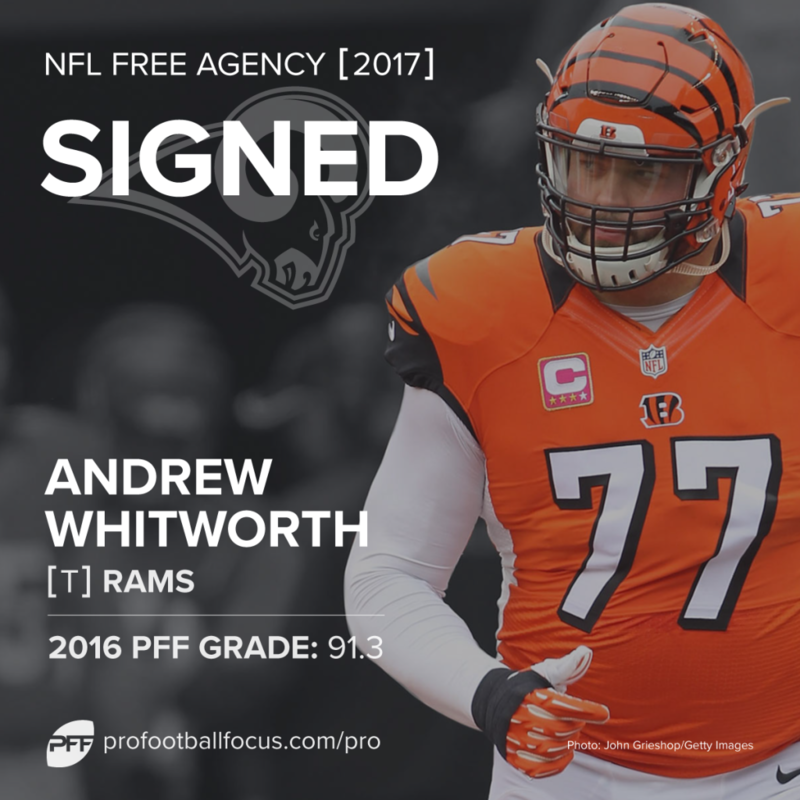 At the price they have signed him to, the Rams got a bargain—the only question is whether they can do anything useful as a team in the time Whitworth has left at the top. Duron Harmon is one of the few players that has the ability to play the deep-lying, single-high free safety role to a very high level, and while he has never been a starter for the Patriots, he has been their nickel safety and a big part of their defense. There are holes to his game, and he has missed over 15 percent of his tackle attempts over his career, but his skill-set is valuable to a defense. 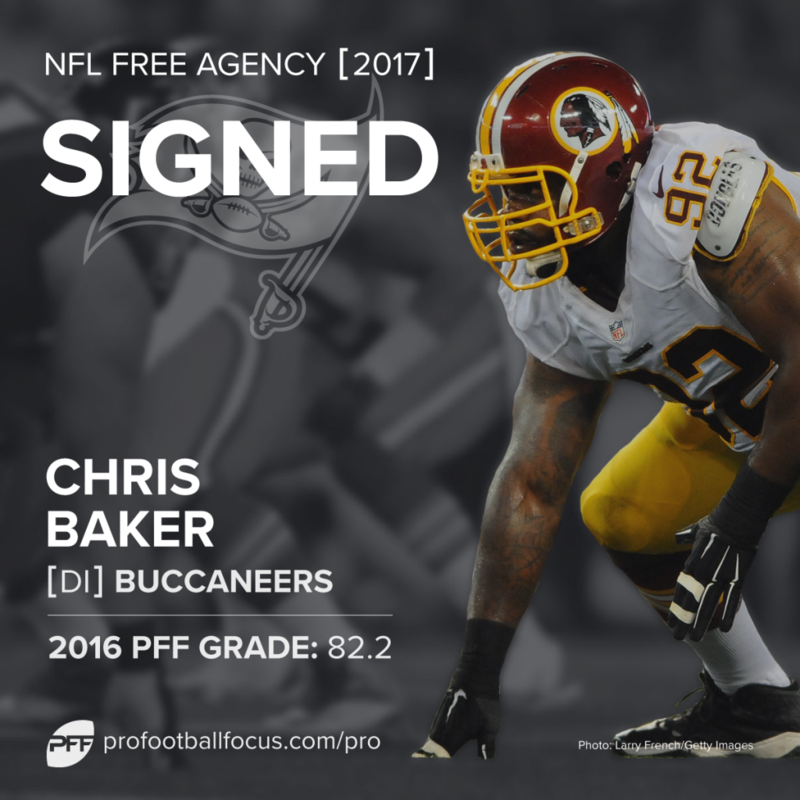 Chris Baker has developed into a fine interior defender, grading well against both the run and pass over the past two seasons. He tweeted that Washington didn’t want him, but the Buccaneers—at that price—have secured themselves a bargain. Pierre Garçon was a natural fit in San Francisco thanks to his familiarity with Kyle Shanahan’s offense from their time together in Washington, but Garçon has even more to offer. He finished 2016 as PFF’s eighth-graded WR (85.8) and dropped just one of the 80 catchable passes sent his way. 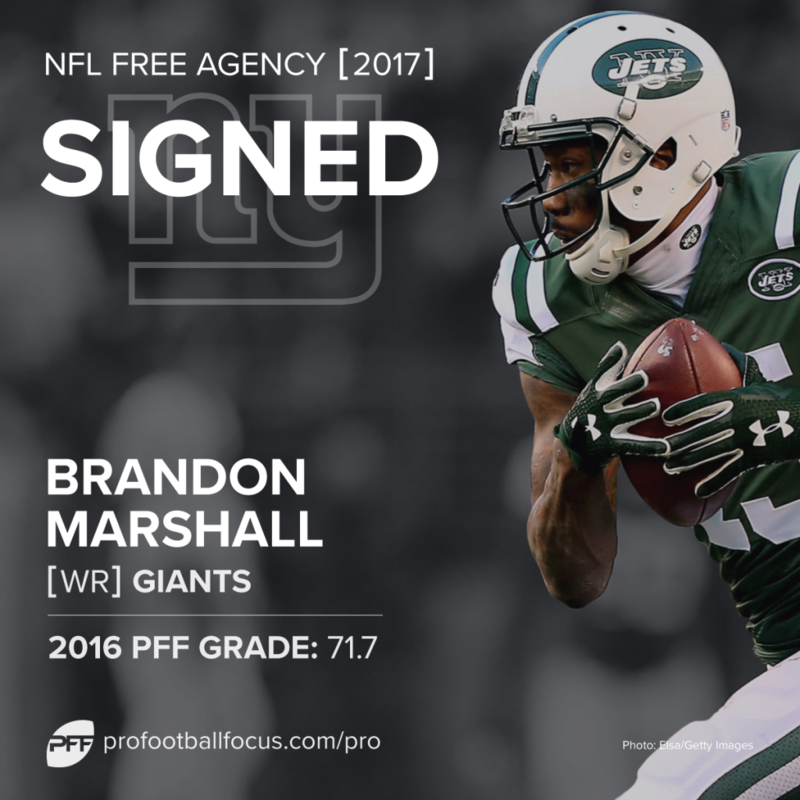 Brandon Marshall saw a significant drop in production and PFF grade in 2016, but he was one of only two players to score a touchdown against Seahawks CB Richard Sherman all season, and still showed plenty of high-quality play. The Giants are betting the downturn was due more to disastrous QB play than it was to Marshall himself, and they’re not betting a lot to find out. Every time J.C. Tretter has been on the field, he has played well, but there just isn’t that much tape to go on. Last season he started seven games for the Packers, allowing eight total QB pressures across them, and was ranked in the top-five league-wide at the position by the time he had to make way for Corey Linsley. Patrick DiMarco has been arguably the best blocking fullback over the past two seasons. He was comfortably the best in 2015, and in the mix this past year. The Bills have obviously decided the fullback is a significant part of their offense, so DiMarco makes good sense to bring on board. John Simon has earned a shot to show he is capable of more in a starting role, and the Colts have structured this deal as a one-year “prove it” contract that has front-loaded his cap hit into 2017 and has no penalties if they cut him loose after this season. Simon has the chance to prove he is worth the whole deal in year one, and if he continues his 2016 play with no injuries he just may do that. He notched 26 total pressures, two batted passes and solid grades against the run and pass before going down hurt. Jabaal Sheard has been an impressive role player for the Patriots over the past few seasons and should help give the Colts some viable pass rush at last. Sheard notched 44 total pressures in 2016 and 64 in 2015, while grading well against the run both years too. Dallas does a nice job in locking up a solid receiving option for extremely modest money. Williams may be capped in terms of his role in Dallas, but he has been a big-play threat for the team with receptions for at least 42 yards in each of his four seasons, and catches of longer than 75 yards in two of them. Mike Adams is still playing at an extremely high level, but the concern in switching teams was that at his age and level of athleticism he might be exposed in another scheme. Carolina has a history of taking experienced, veteran players and maximizing their strengths while minimizing their weaknesses with role, and Adams could continue his fine play for a fraction of his true value in contract terms. Stefen Wisniewski is a starting-caliber player at either guard or center who provides the Eagles with some excellent depth and versatility along the offensive line in case injuries strike again in 2017. He allowed just one sack in 2016 across 383 snaps of pass protection in multiple positions. Calais Campbell may be 30 years old, but he is coming off the best season of his career, trailing only Aaron Donald in PFF grade among interior defensive linemen in 2016, with a mark of 90.4. Campbell notched 44 total QB pressures, a batted pass, and 41 defensive stops for the Cardinals, and should help form a formidable defensive front in Jacksonville. 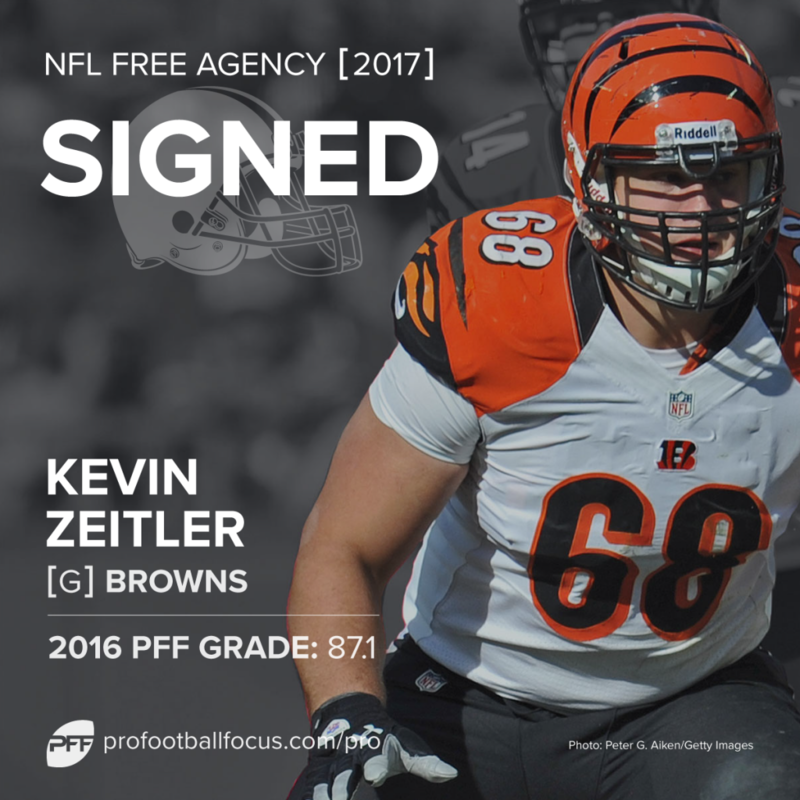 Kevin Zeitler sets the new market for guard contracts, narrowly edging the deal signed by Kelechi Osemele a season ago. Zeitler has been a good, not great guard for several seasons now, grading well as both a run blocker and pass protector, but paying him more than any other guard in the game will likely prove to be a little too rich. Nick Fairley has consistently been a disruptive interior pass-rusher throughout his career, but has rarely put together his best play for a long period, or even been an every-down starter. 2016 saw him play a career-high 723 snaps for the Saints, and he responded with seven sacks and 47 total QB pressures, also career highs. The Ravens have one do-it-all safety in Eric Weddle, and they are a perfect landing spot for Jefferson, who can play in the box and allow Weddle to play deeper off the line and impact coverage more. Ronald Leary only ever lost his starting job in Dallas because La’el Collins fell into the team’s lap due to freak draft-day drama. Last season, he got the job back when Collins went down hurt, and didn’t allow a sack all season while also run-blocking well. 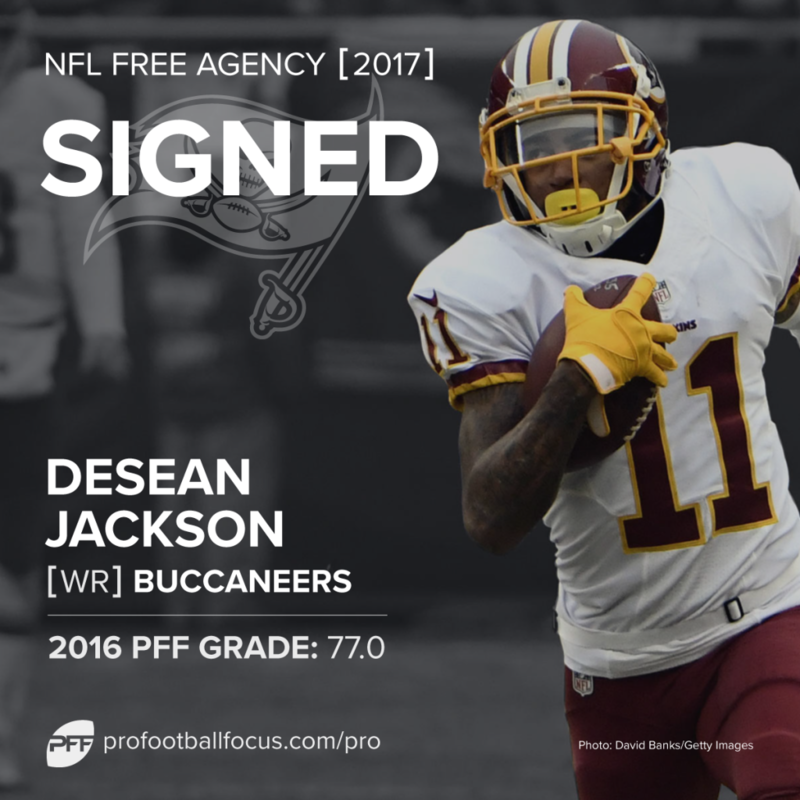 Being a deep threat in this league will always get you paid, and DeSean Jackson remains a player capable of taking the top off a defense, which fits well with Mike Evans in Tampa Bay. Last year, Jackson recorded 579 receiving yards on deep (20-plus air yards) attempts, the most in the league. Kenny Britt notched over 1,000 yards last season with a combination of Case Keenum and Jared Goff throwing him the football. That alone makes it hard to question the contract he got, but that was the best season of his career, and as a No. 1 target, he has some limitations. Barry Church had an excellent year in 2016, but it was the first season that he has posted strong coverage grades at PFF to go along with his typically-impressive run defense. Church has played all over the Dallas defense, but was better this season when employed deeper off the line. The D.J. Swearinger in Arizona was a different player than the one at the heart of every Houston coverage bust in his previous home. Washington needs to hope that’s a result of the player maturing and developing, rather than a peculiar scheme in Arizona that uniquely suited his play. The QB market doesn’t really behave like any other market in the NFL. It’s effectively a binary state of starters earning upwards of $15 million, and everybody else, not. The Bears think Glennon has a shot to be that guy, but aren’t betting more than a year and a bit of that money on it. Alan Branch proved this past season what impact he can have on the New England defense, and was a run-defending monster for the team down the stretch and into the playoffs. Branch also played the most snaps of his career (760 including playoffs), earning the second-best grade of his career, too (80.4). Brandon LaFell proved himself to be a useful part of the Cincinnati receiving corps last season, notching 64 receptions and six touchdowns from his 101 targets. He is a solid player to retain as the team tries to develop a couple of younger players to take his spot. Terrelle Pryor has near limitless upside. In just his first season playing WR, Pryor topped 1,000 receiving yards despite a sequence of poor QBs throwing him the ball in Cleveland. The league clearly isn’t quite ready to buy into the idea that he is worth a huge payday yet, but Washington at least put themselves at the head of the queue to re-sign him next season if he takes another step forward in development. Larry Warford was PFF’s rookie of the year back in 2012, but has never quite hit those heights again. The Saints are banking on the fact that he is back trending in the right direction again, and is still young enough to get back there. Martellus Bennett showed early in 2016 how impressive he could be as a lead TE before injuries struck and he had to fight through the rest of the season less than 100 percent. Even so, his play was key on occasions and he gives the Packers a dynamic TE threat. John Cyprien is a limited safety, but he can be a stud in the box as Tennessee’s strong safety complement to second-year player Kevin Byard. Cyprien’s PFF run-defense grade last season was 98.8, the best we have recorded over a season in the past decade for a safety. Effectively a sub-package corner only, Captain Munnerlyn is a solid slot corner who can do a reasonable job for a team. Last season he allowed just one touchdown on 68 targets, even if he failed to record a single interception. The man with the scouting combine bench press record, Stephen Paea is a solid rotational body on the defensive line, and well worth $2 million over a season. This is a good pick up for Dallas. The Saints were clearly planning for life after Brandin Cooks, and while Ginn isn’t nearly the same player Cooks is, he still possesses the kind of blazing speed that can take the top off a defense and lead to big plays – just as long as he can catch the ball at the end of it all. He was signed to a modest price for the high-reward impact he can have on an offense in that defined role. Kelvin Beachum is one of the toughest evaluations of any free agent. He has one good season in the NFL (2014), but that season was excellent, and he had started the following year well before tearing his knee. Last season with Jacksonville, his first since the injury, was a disaster, but given the money flying around for offensive tackles so far and his potential proven upside, this deal is very reasonable and could pay off for the Jets. Ricky Wagner’s play over the past few seasons has been all over the map. From an outstanding 2014 campaign, to a poor 2015 that saw him surrender 52 total pressures, to a relative bounceback season last year, it’s tough to gauge exactly what player you will be getting going forward. In two of the past three years he has had very solid pass-protection grades, so assuming the Lions are happy there’s a reason behind that drop in 2015, this could prove a very nice signing, especially given the money flying around in the tackle market this offseason. A healthy Kendall Wright is a dangerous weapon for an offense, working primarily from the slot. He has the kind of speed and big-play ability that many slot receivers don’t have, but he has played just 726 snaps over the past two seasons and never played more than 820. His availability is a big question mark, which is why the Bears have only signed on for one year. Julius Peppers has become a situational player as he has advanced in age, but that has allowed him to remain effective by reducing his overall workload. Last season he was still playing at a high level, and one million of his salary in 2017 will be tied to his sack production, giving him plenty of incentive to keep bringing the heat for the Panthers, the team that originally drafted him. This should be a solid addition to the team’s pass-rush rotation. There’s still a place in this world for a blocking TE, and last season Fasano was as good as it gets in that regard. He still has enough about his game to be a viable component in the passing game too, but as a second TE he is an excellent addition to an offense. T.J. Lang has been one of the league’s better guards over the past three seasons, and in 2016 he didn’t allow either a sack or hit over the entire year including the playoffs. In 964 snaps he allowed 11 total pressures and should immediately upgrade the Detroit pass protection. D.J. Fluker will doubtlessly be seen as a draft bust for the Chargers, but the Giants don’t have a high bar to clear to upgrade their tackle spots, and Fluker has been a significantly better tackle than guard so far in the NFL. His run-blocking at tackle has been solid, but in each season starting there he allowed seven sacks. Frank Gore was the bell cow in Indianapolis last year, but Robert Turbin spelled him for 300 snaps and graded well as a runner and blocker. He averaged 2.5 yards per carry after contact, almost half a yard more than Gore, and broke 10 tackles compared to Gore’s 15 despite 216 fewer carries. A player that has been a defensive tackle, off-the-ball linebacker, core special-teamer and more throughout his career finally got an opportunity to start last year and notched 14 sacks and 50 total pressures while also grading well against the run and posting 44 defensive stops. Alexander is far from young, but he deserved this deal for last season alone. In the past, Siliga has shown the ability to be a solid run defender, but he struggled to find a role in 2016 between the Seahawks and Buccaneers. He played just 160 snaps and wasn’t great in them, but for a low-priced deal he could be a solid backup nose tackle. His most recent tape is the best of his career, with Wilcox grading well in 2016 across 573 snaps of action for Dallas including the post season. He earned solid grades in coverage thanks to making a series of defensive stops, ending the season with 14 of them and missing just seven of 56 attempts over the year. This is a like-for-like replacement for Eric Weems, who left the team via free agency. Roberts has been an impressive return man in recent seasons and can get by on other special-teams units, as opposed to Weems who has the edge there but isn’t quite the return man Roberts is. Karlos Dansby’s career is definitely in its twilight, but he is still playing at the level of a capable starter at linebacker, and is a player that can help improve the performance of those around him by understanding where everybody needs to be and getting everybody organized. His third stint in Arizona may be the final year of his career, but it’s likely a solid move. Aldrick Robinson can be an excellent deep threat for an offense, and the 49ers are building a receiving corps that can be a balanced group of weapons for whatever QB they ultimately settle on as being the future there. Robinson fits nicely in that group. Last season for Houston, Quintin Demps had a career year, earning himself a healthy contract from the Chicago Bears. He notched six interceptions and two pass breakups, and finished the season with a sequence of nine games without a poor performance. Brian Hoyer is a very solid NFL QB… right up until around Week 10 every season, where something seems to happen to him to turn him into a pumpkin. His career interception rate quadruples after Halloween and there are notable differences in completion percentage, passer rating and touchdown percentage too. He should provide a solid bridge option for the 49ers though. Eddie Lacy at his best is a versatile, dynamic and incredibly effective weapon. Injury and weight problems, however, have prevented us from seeing that player for an extended period since 2014. That being said, the Seahawks acquired Marshawn Lynch when it looked like his career was on the wane, and that turned out pretty well. Lacy has the ability to have that kind of impact, but he needs to buy into it. Hightower was one of the top free agents on the market, but his unquestioned best fit is within the New England defense that has made him such a star. He has graded well in every facet of the game for three straight seasons and has been a significant supplement to the Patriots’ pass rush on the blitz, with an average of 33 total QB pressures in the past three seasons. Gilmore is one of the few corners in this free-agent crop capable of manning a No. 1 role for a defense, so he was always going to get big money, but his PFF play-earned contract figure shows just how far short of his reputation his play has been at times over the past few seasons. In 2016, Gilmore allowed 60.3 percent of passes thrown his way to be caught, and was beaten for 15.6 yards per catch. Nick Perry finally justified his first-round draft status in 2016, finishing the season with 11 sacks and 46 total QB pressures while also grading well against the run. It was the first season of true high-quality play from him, though, but Green Bay is paying him to continue that upward curve. Brandon Williams is one of the league’s better run defenders, but 2016 was far from his best work. He notched 31 defensive stops last season, which ranked 12th among interior defenders, 21 shy of Damon Harrison, whose contract he eclipsed with this deal. Logan Ryan is a player that has been protected well by the Patriots’ scheme, but Tennessee played more man coverage last year than any other team, so he’ll have a lot less help. Last season he struggled early, but from Week 11 onwards, Ryan allowed fewer than 40 yards receiving in five games. Micah Hyde is a versatile player, having spent time in the slot, out on the perimeter at corner and as a safety for the Packers. The money looks rich, but he can add a lot to a defense in need of that kind of versatility and matchup boost. Jahleel Addae was a solid member of the Chargers’ secondary last season, but that represents a noted bump over his play baseline set in the previous couple of seasons. The contract he received isn’t a huge number, but it’s a little more risk than the data indicates he’s worth. Last season, Jack Doyle more than doubled his career-high in targets (to 72) and receptions (to 59), as well as scoring five touchdowns and gaining 584 yards. He became a legitimate receiving weapon for the Colts and held his own as a run blocker. Kyle Juszczyk is as good as it gets as a fullback in today’s NFL, thanks largely to his versatility, but he has never played more than 41.7 percent of an offense’s snaps, so the contract he has been signed to is a little steep. Chance Warmack has played his way onto the bench, and is at best an interesting reclamation project at this point. He played just 134 snaps last season for the Titans. Jacquizz Rodgers has become part of a backfield-by-committee in his role in the NFL, but he is a shifty back that broke 18 tackles in 2016 on 129 carries, averaging 2.7 yards per carry after contact. Mike Tolbert isn’t really a fullback, but rather a round running back who has the occasional highlight-reel play. However, he earned negative grades in all facets of the game last season except pass blocking, where he allowed just one hurry all year. Stacy McGee had the best season of his career in 2016, but it was a radical departure to three mediocre-at-best years before that, and it lasted just 242 snaps before injury shut him down. The potential is there for him to be a productive player, but this is an expensive gamble. 2016 was the first season that Cornelius Washington saw the field for more than 80 snaps over a season. He played 364 total snaps, and though he notched only two sacks, he did generate 29 total QB pressures on 246 pass rushes, earning a solid pass-rushing grade. The league is clearly disappointed enough with the ceiling of Prince Amukamara that he doesn’t seem to be able to talk his way into a long-term deal for significant money, as he takes another one-year deal that will pay him solid starter money. In 2016, Amukamara allowed five touchdowns and 64.1 percent of passes into his coverage to be caught. Danny Woodhead comes in to take the third-down-back role in Baltimore. Woodhead has always been one of the league’s better receiving backs but he is coming off an injury that kept him out of all but 55 snaps of the 2016 season. The year before he was one of the league’s best receiving weapons, catching 83.3 percent of targets and breaking 19 tackles on 80 receptions. Daniel Sorensen has seen his snaps increase on defense in each of the past three seasons, and in 2016 he played 573, posting his best year in the NFL. His coverage grade was the highlight of his campaign and he notched three interceptions and two pass breakups over the year. Green Bay’s big move at TE was signing Martellus Bennett, so Kendricks is something of a kick-the-tires move lower down the roster. He has some ability as a receiving weapon, but has never been able to consistently put it together in the NFL. Nolan Carroll was one of Philadelphia’s top three corners in 2016, but that entire group struggled collectively to hold up in the pass game. He surrendered 752 receiving yards, four touchdowns and a passer rating of 100.0 across 89 targets, but will be stepping into a better coverage unit in Dallas. John Jerry’s baseline has been hovering around average for his time starting. Last season for the Giants, he played 1,123 snaps including the postseason, allowing just two sacks and 26 total pressures. His run blocking has never been above average, but he can hold his own as a starter. Lawrence Guy has never played more than 500 snaps in a season, but he has proven to be a capable member of a defensive line rotation, and graded well against both the run and as a pass-rusher at different times in his career. In 2016 he had just one sack, but the year before he had five, and 29 defensive stops. Jordan Mills has plenty of extensive experience starting, but very little of it has been positive. He surrendered eight sacks last season at right tackle for the Bills, but could be a low-priced sixth lineman. Darren Fells was once thought to be a breakout candidate for the Cardinals, but 2016 saw him receive just 17 targets. He caught 15 of them for 154 yards and a touchdown, breaking five tackles after the catch. Nate Allen has seen little playing time over the past couple of seasons (459 snaps over the past two seasons combined), but in 2014 when he last started over a full season it was the best play of his career. He has the size and athleticism to succeed in any scheme, but his play is a projection at this point. Markus Wheaton consistently failed to prove he could become the second starting receiver in Pittsburgh alongside Antonio Brown, but continually flashed ability and could have potential as a slot receiver. In 2015 he caught 51 passes for 802 yards and five scores. Levine Toilolo has been a role player in the Atlanta Falcons offense for the past few seasons, catching 66.7 percent of his targets in 2016 and gaining an impressive 18.4 yards per reception, albeit on just 16 catches. The best season Dre Kirkpatrick has had in the NFL was 2016, and he was average at best. Of the quality players the Bengals had hitting the open market, making Kirkpatrick the one they had to keep hold of was curious. For his career, he has allowed 58.6 percent of passes thrown his way to be caught and has been penalized 29 times, 25 of which have come in his two seasons as a starter. Kenny Stills is getting that deep-threat boost to his finances. He did make some big plays for Miami last season, scoring nine touchdowns, but didn’t necessarily have to do a whole lot to score some of them. He is a legitimate deep threat, but doesn’t look particularly likely to develop into much beyond that. 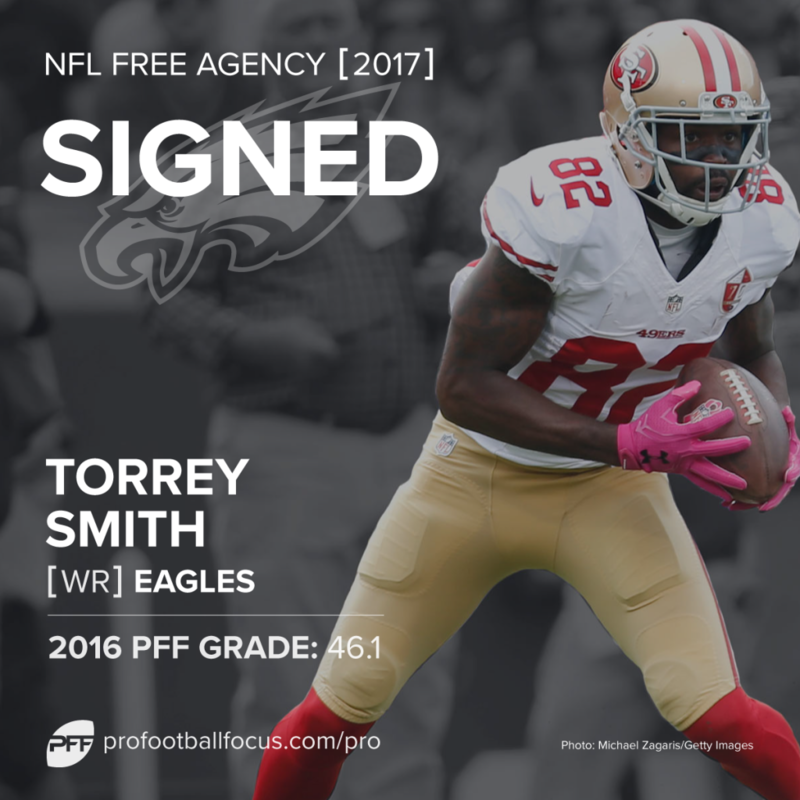 Torrey Smith is supposed to add the deep threat to the Philadelphia receiving corps, but has shown little of that ability the past couple of seasons in San Francisco, albeit not aided by the QB situation there. The Eagles are paying for the hope he can get back to something like his Baltimore play again. The Rams are again paying big money to a receiver that has yet to come close to producing at that level. Robert Woods joins Tavon Austin as players never to have topped 700 receiving yards in their careers as big-money Rams receivers. Woods has flashed the ability to do more, but those flashes have done very well to see those contract numbers. 2016 saw Vernon Davis rediscover something of a spark in the passing game, but his run blocking was ugly, receiving the worst PFF grade of his career in that area. As a second TE to Jordan Reed, Davis needs to be able to block better than he has over the past few seasons. Rhett Ellison’s play has steadily declined since his rookie year in 2012, where he was best as a fullback and not a TE for the Vikings. 2016 saw him play just 260 snaps, the lowest figure of his career. Terrell McClain was thrown to the wolves as a rookie in Carolina, and has never really recovered. He flashed the ability to be an intriguing sub-package disruptor for Dallas in 2016, but that is a lot of money for a player that has only flashed talent at best in his NFL career. Akeem Spence has played his way to the bench after being the DT alongside Gerald McCoy in Tampa Bay. His pass rush has largely been absent, but as a nose tackle, his role was more of a run stuffer anyway, but his grades against the run have been poor as he has found himself easily moved at the point of attack, and he has yet to top 20 defensive stops over a season. D.J. Hayden’s play has been so bad since being drafted by the Raiders that he played his way firmly onto the bench, and this should be seen as little more than kicking the tires on a player that had a high reputation as a draft prospect. Only the length of the deal keeps this from being a worse grade, in that at least the Lions are only tied to him for one season. Riley Reiff’s career baseline is certainly far higher than anybody else on Minnesota’s roster who could play tackle for the team in 2017, but he is trending the wrong direction and coming off the worst season of his career. Pass protection is the weaker area of his game, and his four starting seasons have averaged 46 total pressures surrendered, but he has typically been (until 2016) a solid run-blocker. He should prove to be an upgrade for the Vikings, but they have paid huge money to secure it. Menelik Watson began last season well before getting injured and never fully recovering as the season wore on. In his previous seasons earning game time he struggled, particularly in pass protection, surrendering 25 total pressures and six penalties over fewer than 500 snaps in 2014. The beginning of his 2016 campaign was encouraging, but it’s a ray of light in a lot of poor tape, so this is something of a gamble. At best this is a sideways move at backup QB and when the Eagles already had a significant portion of money invested in backup Chase Daniel it seems like a move that didn’t need to be made. Lawrence Timmons has had a rollercoaster of a career in the NFL so far, but he is coming off back-to-back seasons of underwhelming play. He notched over 100 solo tackles in 2016, but missed 17. Ryan Griffin has been a significant role player on offense over the past few seasons and has seen his targets increase in each of the past two seasons, from 15 in 2014 to 42 and then 78 in 2016. Those 78 targets resulted in 53 catches and 471 yards but five drops and a fumble. Marcus Cooper was back starting in 2016 and it resulted in 63.9 percent of targets being caught by the intended receiver and 751 receiving yards over the season. He had four interceptions and six pass breakups, but also surrendered four touchdowns. In the past two seasons, Josh Robinson has played 14 total snaps on defense. In his first year under Mike Zimmer in Minnesota, he looked like he was beginning to improve and become a viable cover guy, but his time in Tampa Bay has been purely limited to special teams, and that’s a lot of money for special teams only. Earl Watford is still young enough to have hidden upside, but when called upon to start in 2016 things did not go well. He allowed eight sacks in 788 snaps of action, and an additional 38 total pressures while failing to offset that with run-blocking. Three of his final four games were disastrous. Marshall Newhouse graded well enough in 2016, but he only played 524 snaps, and his career baseline is far worse. He can start in a pinch, and is capable of good games, but the longer he is on the field the worse things tend to get, and his last full season of starting resulted in five sacks and 51 total pressures surrendered. Dion Sims has struggled in particular as a pass-blocker throughout his career, and last season for Miami that resulted in him surrendering two sacks, four hits and three hurries when kept at home to block. As a receiver he caught 31 of 39 passes thrown his way for 390 yards and four scores, so may be far better sent out into pass patterns than kept at home to block. Malcolm Smith’s career highlight is being named Super Bowl MVP in a game in which he was far from the best player. Smith’s career began brightly in Seattle, but from that Super Bowl triumph onward it has been steadily declining, and he has done nothing recently to suggest he should be starting, leading the Raiders in tackles last season but also missing 13 and allowing six touchdowns and a passer rating of 113 when targeted in coverage. The Saints are backing on A.J. Klein’s ability to step into a larger role and start for them. He has played a reasonable number of snaps over each of the past two seasons as Luke Kuechly’s backup given the struggles of the star LB with concussions, and the results have been mixed. His play in 2015 was good, but this past year he allowed a passer rating of 119.6 when targeted and 76.9 percent of the targets into his coverage to be caught. Ben Ijalana played 867 snaps last season for the Jets, the first snaps of consequence in his career, and he struggled, particularly as a pass-blocker. He surrendered eight sacks and 43 total pressures across the season. Matt Kalil has earned PFF grades of 43.8, 68.4 and 36.9 over the past three seasons, one of which was almost entirely lost to injury. His best season was as a rookie in 2012, and since then, he has been varying shades of poor. His play suggests he should be making little more than the veteran minimum, not walking into another starting job as one of the best-paid tackles in the league. 2016 may have been the best year of Andre Branch’s career, and there was little there to suggest he was worth this kind of contract. He did notch seven sacks, but rushed the passer 467 times to get them. His pass-rushing grade (67.9) ranked 61st among edge defenders. The headline figure for this contract looks insane, but though some reports had the guaranteed money at just $13.5 million, the later consensus seems to be a monstrous $25 million of guaranteed money, turning a one-year risk into a multi-year millstone for the Chargers. Okung remains a good run blocker—particularly on the backside of zone plays—but has his struggles in pass blocking, and was last solid in that regard in 2012. Mike Remmers was put in a tough spot in 2016, playing left tackle when he had struggled enough on the right side. At RT, the season before, he had actually been average enough — with good and bad games — before being taken to pieces in the Super Bowl by Von Miller. In that game, he surrendered three sacks and seven hurries and may have been the single biggest reason for the defeat. The Vikings have paid him very strong money to try and rediscover his best play from that 2015 campaign, which consists really of five games. The Bengals loved Domata Peko because he was consistent and always played his assignment, but his days of viable play are long gone. Peko’s highest PFF grade in the past four seasons is 46.6 and seven of his last nine years have seen grades of under 60. Denver might find something the Bengals couldn’t, but there’s no evidence to expect it. Jermaine Gresham may be coming off the worst season of his career, and has somehow parlayed that into a $28 million contract. He added to the Cardinals’ problems run-blocking, but also dropped five passes on just 58 targets, while also fumbling the football once. Akeem Spence was the latest player the Bucs have tried and failed to turn into the viable nose tackle in their 4-3 scheme next to Gerald McCoy. Spence played 362 snaps last season and had just 12 defensive stops, earning a PFF grade of 39.2 over the season. This trade effectively amounts to the acquisition of WR Brandin Cooks for a first-round draft choice. The Patriots prefer veteran receivers who have proven NFL pedigree, and Cooks does give them a deep threat and athletic profile they don’t already have on the roster. Cooks has 17 touchdowns over the past two seasons. The Saints clearly were happy to move on from him and get a solid return back in the trade. This looks like a classic win-win. The Houston Texans effectively felt the Brock Osweiler deal they made a season ago was so bad that they have paid the Browns a second-round pick just to get them to take the contract off their books. For Cleveland, they have effectively managed to “buy” a second round pick in 2018 by having the cap space to take on that contract. This deal becomes even worse for Houston if the Browns convert some of that contract to a roster bonus and successfully flip Osweiler for a profit in draft picks, something the Texans had the room to do themselves. Kony Ealy has flashed talent, notably in the Super Bowl a year ago, where he had the game of his career with three sacks, but was average at best last year as a starter before moving to the bench, notching just 31 total pressures over the season. The Panthers have clearly decided to move on, so getting something back, however little, makes sense. William Hayes may be most famous for believing in mermaids but not dinosaurs, but he has also been a quality player on the field for the past five years or so, and instantly solves a problem the Dolphins have had at DE opposite Cameron Wake for several seasons. To acquire him for the price of moving 17 spots at the back end of the draft is a steal. Dwayne Allen has shown big time talent, but injuries have reduced his effectiveness since an outstanding rookie campaign. He has the potential to be a fine complement to Rob Gronkowski, but it coming off the worst season of his career. Being traded for a seventh-round pick in the draft a year away is pretty much as little as a team can actually give up in a deal. It is literally just giving a team something to save them from releasing him and being able to jump the queue in terms of waivers or the free for all when he becomes a free agent.